TURLOCK, CA (July 9, 2018) – Retired Covenant pastor and chaplain Luther Englund died June 29. He was 95. Luther was born at home on November 11, 1922, to Howard and Hilma Englund in Minneapolis, Minnesota. He earned an associate’s degree from North Park College in Chicago; a bachelor’s degree from Augustana College in Sioux Falls, South Dakota; and a seminary degree from North Park Theological Seminary. Luther married Elvira Carlson on June 20, 1951. The couple served a total of 31 years at churches in Buffalo, New York; Malmo, Alberta; Warren and Trimont, Minnesota; and Hilmar, California. In 1977 he became the chaplain at Emanuel Medical Center in Turlock until retirement in 1998. 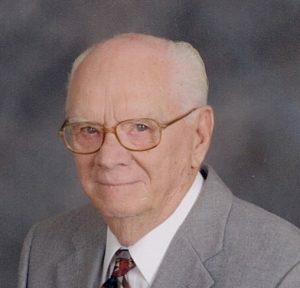 Calvary Baptist Church then called him to be congregational care pastor, where he served for 10 years before retiring once more at the age of 94. He continued to do visitation and occasionally officiate at funerals. Throughout his ministry, Luther served terms on the Covenant National Boards of Missions, Ministry, and Pensions as well as on a number of district and local boards and committees. Luther was honored in the Turlock community, receiving the Good Samaritan Award from Emanuel Medical Center in 1989, the Humanitarian of the Year Award from the Chamber of Commerce in 1999, and was named a Paul Harris Fellow by two chapters of Rotary. He is survived by his wife; two daughters, Beth Adams (Alan) and Marti Anderson (Bill); and a son, Daniel Englund (Julie); 12 grandchildren and five great-grandchildren. He was preceded in death by his son Karl Englund (Joyce) in 2016. A memorial service is planned for Friday, August 24, at Turlock Covenant Church, 316 S. Laurel Street, Turlock, CA, at 11 a.m.
Memorial gifts may be given in Luther’s name to Covenant Kids Congo, the Evangelical Covenant Church, 8303 West Higgins Road, Chicago, IL 60631, or Westside Ministries, 952 Columbia Avenue, Turlock, CA 95380, or to a ministry of your choice. Pastor Englund was pastor in Warren, Minnesota in the early 60’s. He was like a youth pastor to the young people. He took a group of high school students to Chicago to see North Park. We also saw a lot of Chicago in a weekend. He took several of us to Bible Camp in Manitoba where he was the speaker. He encouraged several of us to attend Covenant Bible Institute in Prince Albert. All of these had a great impact on me. I am grateful to this day for God using him in my life.